Turmeric – There is every reason to crown this spice as the king of all spices. 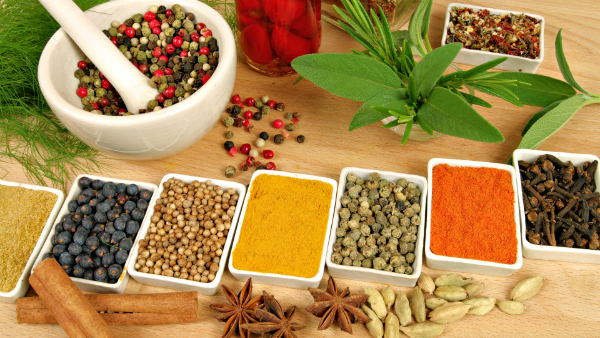 To begin with, turmeric is known for its healing properties. Applying turmeric paste on cuts, burns and wounds disinfects the area almost instantly and speeds the process of recovery. Secondly, turmeric functions as a natural immunity booster. The presence of a certain substance known as lipopolysaccharide boosts the immune system to put up a better fight against common seasonal health issues like cold, flu etc. Thirdly, turmeric is also recognized for playing a role in boosting brain health and retarding the risk of developing conditions like Alzheimer’s disease. At the same time, turmeric is linked with improving the functioning of the liver and digestive system as well. Cumin – Besides the heavenly aroma, cumin seeds or powdered cumin is blessed with multifaceted health benefits that begin with improvement of the digestive system. Essential supportive functions like stimulation of salivary glands, stimulation of enzymes that breakdown macromolecules like proteins, fats and sugars etc. can be contributed to cumin. Cumin also plays a role in preventing cancer because of its anti carcinogenic properties while contributing to flushing out toxins from the body. Cloves – Cloves, which are used widely for lavish seasoning because of its strong yet impactful aroma, also carries properties that are meant to bestow head-to-toe health benefits. From boosting oral health to curing nausea and fatigue; from helping in overcoming sinusitis to relieving morning sickness, there is very little that is outside the purview of this tiny spice. The beauty benefits of clove can also not be ignored. Clove oil has been found potent in improving skin conditions like acne while removing scars and blemishes with perfection. Its antioxidant properties are critical in maintaining healthy and glowing skin. Red Chilli Powder – This smouldering spice is widely used in Thai, Mexican and Indian cooking in many different forms. Besides causing teary eyes and watering noses, this spice has been held responsible for overall cardiovascular benefits that is caused by reducing cholesterol, triglyceride levels and platelet aggregation in blood. It is also known for retarding prostrate cancer, stomach ulcers and type II diabetes. The aspect of weight loss has also been associated with red chilli powder. Cinnamon – Cinnamon is one of the most popular spices the world over for its sweet yet burning flavour. Besides its impact on the taste buds, cinnamon is known to fight a number of health issues like Irritable Bowel Syndrome, Candida yeast infection, stomach flu, nail fungus, E coli etc. Cinnamon has also been named as instrumental in easing pains in osteoporosis, improving brain health and preventing overall cognitive decline.